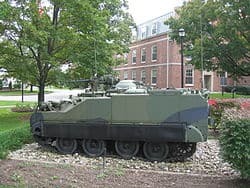 The Canadian Forces College marked its 65th Anniversary at Armour Heights in Oct, 2008. 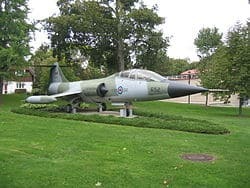 Founded in 1943 as the RCAF War Staff College, it has undergone several stages of reorganization that reflect the evolution of the professional development of Canadian military officers. After the war, in 1945, it was designated as the RCAF Staff College. In 1962, the Staff College became a component of the Air Force College that also included a Headquarters, a Staff School and an Extension School. The latter was operated jointly with the University of Toronto Extension Department from 1963 to 1974. As a result of unification of an integration of the Armed Forces in 1974, a new course was designed to meet the requirements of a unified force structure. In 1966, it was introduced as part of the curriculum of the re-designated Canadian Forces College. Following the Officer Development Board Report of 1969, further modifications were made and, in 1974, the Staff College was converted to the Command and Staff Course which now exists. In 1998, the CFC’s role was expanded, as two new courses were inaugurated: the Advanced Military Studies Course for the Sept-Dec period, followed by the National Securities Studies Course from Jan to June. The two courses are independent, and some senior officers attend the courses in sequence. It is fitting that the College site at Armour Heights has been associated with military aeronautics and civilian aviation. Adjacent to the present college property, an airfield was built in 1917 as a training base for the Royal Flying Corps. In 1918, it was used by the School of Special Flying to train Royal Flying Corp instructors in newly developed techniques of flight instruction. In 1919, it was occupied by Bishop-Barker Aeroplanes Limited, a commercial venture of two distinguished combat pilots, William Avery Bishop and William George Barker. The College was first housed in the present-day Officers’ Mess, with its adjoining garage and converted stables; these facilities were originally rented and finally purchased by the RCAF in 1946. This stately mansion was built in 1914 as a private residence for Colonel F.B. Robins, Honorary Colonel of the Toronto Scottish Regiment. The College was expanded with the construction of Curtis Hall in 1952 and its enlargements in 1961 and 1973. Existing temporary structures were removed in 1988 after the completion of Burns Hall, which houses the students’ wing and an outstanding military library, the Air Vice-Marshal K.L.B. Hodson Memorial Library. In 1998, a third floor and the Rowley Auditorium were added to the north wing of Curtis Hall to accommodate newly-established advanced courses. The Ralston Residence, with 96 suites, was completed in Oct. 1999. Construction of an extension to Curtis and Burns Halls were begun in the Fall of 2001 and completed in Spring, 2002. The extension, DeWolf Hall provides additional office space, an expansion to the library and facilities for exercise support and war-gaming. The Officers’ Mess/Quarters is a recognized Federal Heritage building 1991 on the Register of the Government of Canada Heritage Buildings. 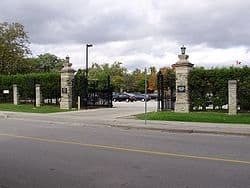 The Canadian Forces Staff School for junior officers, formerly located at 1107 Avenue Road, was determined to be redundant and closed in 1994, and the property was later sold to the Toronto Catholic District School Board.